Reliability and innovation are the core values of PROFIGIPS. We specialize in production and distribution of the highest quality construction profiles. Our company was established in 2002. Our investments have strengthened our market position in Poland as well as in European markets. The proof of our expansion is establishing two branches of our company; PROFIGIPS. RO in Romania in 2007 and PROFIGIPSBEL in Belarus in 2014. The high standards and esthetics are the core of our business activity. We are driven by professionalism and ensure high quality of the products as well as competitive prices. Well-developed technological park enables efficient realization even of the most complex orders. We have been cooperating with the best suppliers of PVC granules, PP, aluminum and steel strips. We have been constantly growing in order to guarantee a high level of products in accordance with the European standards. We offer a wide range of products that we take great care to adjust to our customers’ needs. We offer products such as : aluminum corner profiles, PVC profiles, steel screeds, window profiles as well as ribbon beads. As the first ones in Poland we have started the production of the wet plaster profile i.e. PROFIGIPS corner profile. The PROFIGIPS corner profile is characterized by a specific shape protected by industrial shape patent. Our products are widely used in construction industry and have won popularity among customers. Thanks to our well-developed transport and distribution channels the products of PROFIGIPS can be promptly delivered to European destinations. 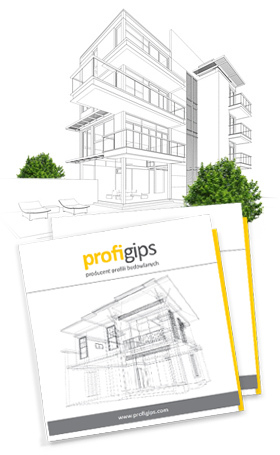 The solutions offered by PROFIGIPS meet construction sector’s current requirements. We provide our customers with technical and sales support as well as with free trainings. The quality of our products makes PROFIGIPS a sought-after recognizable brand.